With so much to see and do in the small town and cruise ship port of Stavanger, you will want to get an early start and see it all on one of our Stavanger shore excursions. From outdoor natural beauty to museum to interesting attractions, enjoy your stay in- or cruise to Stavanger. Located on the southwestern coast of Norway, Stavanger is unique in having mountains, fjords and a lot of flat coastal beach and marshes. The climate is mild but occasionally windy. The summer visitor season is quite pleasant with average temperatures ranging from 63 to 66 F (17 to 19C) and the sunniest months are May to July. Round-trip route with on/off privileges in Stavanger! Comfortable open top city shore excursion buses! Climate-controlled buses with WiFi access! Easy to use system map of Stavanger! The audio narration on the bus is available in 8 languages! A total of 10 Bus stops at the must-see sites! 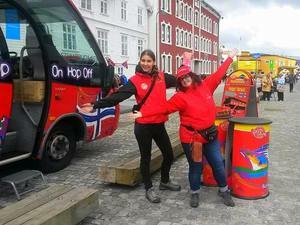 Get the most out of your stop in this Stavanger Excursion onboard the sightseeing bus! Hop off where you want to explore, then hop back on.